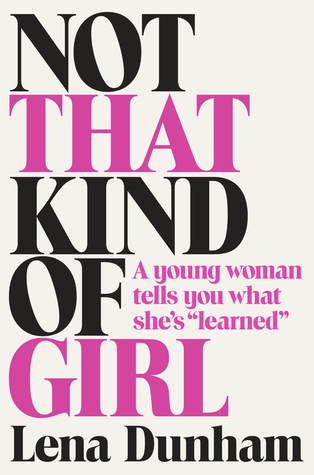 My knowledge of Lena Dunham before I picked up this book was pretty limited – I knew she was the creator/writer/star of Girls and that was about it. Despite that, I picked this up because I’d heard so good things about it and I have this new obsession about trying books that are normally out of my comfort zone. I enjoyed reading it for the most part. I personally found it funny. Admittedly, there wasn’t a lot I could relate too, but there were still things I found funny even though I’d never experienced something like that. It was also reasonably quick and easy to get through – it didn’t require a lot of thought so I could read it late at night when I was starting to get a little tired. There were some things I didn’t like. I found it kind of hard to follow at some points – I would get confused with people in the story. The biggest thing was the timeline – there wasn’t really one at all, the entire story was just all over the place. I never realised how much I appreciated strict linear timelines until now. There were also a few parts that I just found completely unnecessary or just plain weird. This might sound strange, but I don’t know if it’s a book I would recommend. Sure, I enjoyed it but I think you need to be in a particular mood to read something like this.